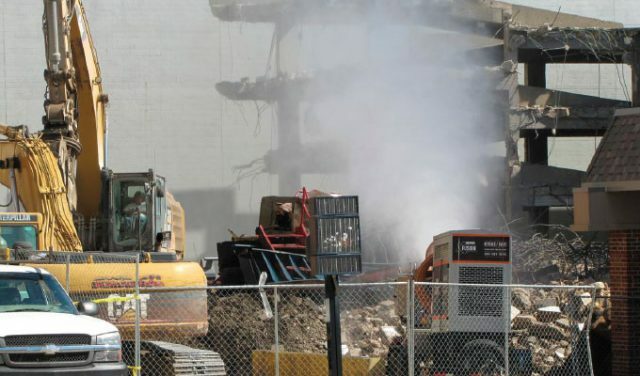 A pioneer in industrial dust control helped a demolition firm contain fugitive dust emissions during the teardown of a 5-story concrete parking deck in a densely populated area. River City Demolition used a self-contained and mobile DustBoss DB-60 Fusion manufactured by BossTek to suppress airborne dust created by the jaw processor and falling debris. The result was adjustable wide-area control of airborne and surface dust that reduced the need for manned hoses and maintained the air quality needed to comply with regulations. From the outset, the planners realized that the downtown location of the parking deck would require dust control beyond the conventional approach of manual spraying with a fire hose. Because of the close-in location and confined space, River City crews decided to use a jaw processor to pulverize the concrete and take the parking decks down one section at a time. That helped avoid dust clouds from large sections falling at once, but Runyon stressed the need for containment when he spoke to BossTek Sales Manager Mike Lewis. “When Josh called us, we had a DustBoss DB-60 Fusion on hand, which is one of our larger designs that’s equipped with its own generator for locations without convenient access to power,” Lewis comments. With all components mounted on a road-worthy trailer, the system gave River City crews the versatility to position the fan-driven unit wherever it was needed on a given day. The water source was a municipal hydrant located nearby, fed by a standard 2-inch hose. The DB-60 Fusion forces water through a circular stainless steel manifold with 30 atomizing spray nozzles, then launches millions of tiny droplets with a powerful 25 hp fan that produces 30,000 cfm of air flow. Atomized mist droplets of 50 to 200 microns in size are thrown out in a 200-foot cone at an adjustable 0 to 50-degree elevation angle, capturing airborne dust particles and dragging them to the ground. Unlike industrial sprinklers used for the same purpose, which can require 500 gpm or more of water, the DB-60 uses only approximately 23 gpm. Rather than have personnel handling hoses to suppress the dust, the single atomized misting unit delivers 62,800 square feet of coverage, while using far less water than hoses and sprinklers, helping contractors avoid over-saturation and run-off. The unit is paired with a 45 kW gen-set featuring a John Deere Tier III Flex engine with a 100-gallon fuel tank, allowing up to 24 hours of runtime. The efficient diesel engine delivers 480 Volts (60 Hz) with a full load current of 46 amps. At just 80 inches wide, the system can be placed virtually anywhere dust suppression is needed and adjusted based on changes in wind or work activity. The optional dosing pump is powered from the standard 120V electrical outlet on the gen set, allowing operators to precisely meter surfactants or other additives. The unit’s versatility makes it suitable for uneven ground, as well as open spaces or tiered terrain. Water sources can vary, and the unit requires a constant supply pressure of just 10 psi. Standard municipal water pressures are generally around 40-50 psi. The water is delivered to the atomized misting unit through a hose with a cam-and-groove quick disconnect coupling leading to the booster pump. The pump adds approximately 150 psi, with a maximum of 250 psi, depending on the inlet pressure. For use with a non-potable water source, the Fusion can be equipped with a number of filter options. 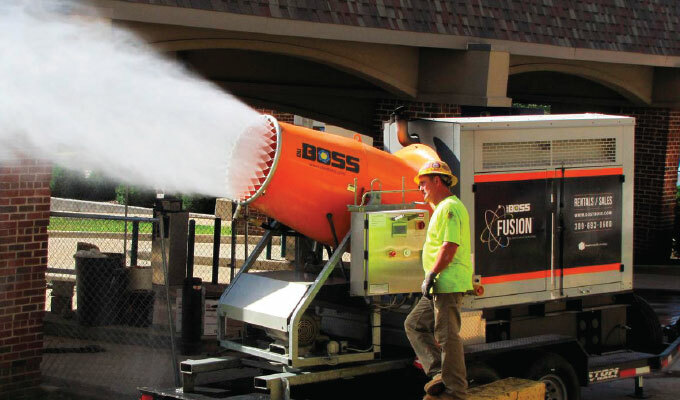 For more than a decade, BossTek has been an innovator in dust suppression, developing a wide range of equipment and accessories that enable atomized mist technology to control fugitive particles for applications in demolition, construction, waste and scrap handling, recycling, and landfills. Recently, the company has extended its expertise to odor management solutions using similar technology, which distributes safe and environmentally friendly topical and airborne deodorants. 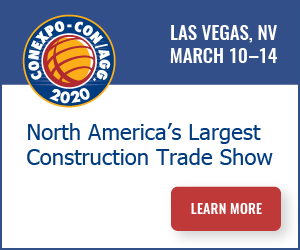 Headquartered in Peoria, Illinois, the company’s dust and odor control units are designed and manufactured in the USA and delivered to customers around the world, with its equipment sold to users in 40 different countries to date. For more information about BossTek and its solutions for dust suppression, visit www.bosstek.com.